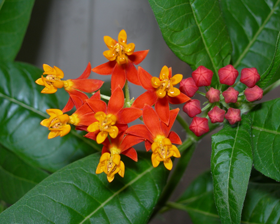 Asclepias or Butterfly weed is a native perennial with flat-topped, very bright orange-red or yellow flower clusters at the ends of its stems or in its leaf axils. From midsummer to autumn, it produces clusters of brightly colored flowers that attract insects, followed by fruit and showy seed. Plant in a border, meadow, butterfly garden, or wildflower garden. Height 50-70cm. Sow seeds in a cold frame in early spring. Divide plants or take basal cuttings in spring.